A new portrait of Mozart imagines the composer as a "daring" and "edgy" musician in the mould of Johnny Rotten. The oil painting was commissioned by Royal Northern Sinfonia, which wants to challenge the Austrian's "chocolate box" portrayal, ahead its new season. "Somehow we've come to think of his music as pretty," said the orchestra's music director Lars Vogt. "But that music is often dramatic and dark. Those qualities must have been there in the man." The portrait was painted by renowned American artist Tim O'Brien, and will be projected onto buildings around the orchestra's home towns of Newcastle and Gateshead over the coming months. 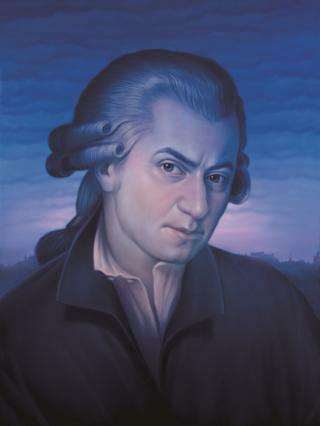 Regarded as one of the greatest composers of all time, Mozart wrote more than 600 works, including some of the most celebrated and enduring pieces of classical music, before he died at the age of 35. Only 14 images of the composer are known to have been created during his lifetime, but many are stylised or incomplete. The best physical description came from baritone Luigi Bassi, for whom Mozart had written the role of Don Giovanni. "Mr Mozart was an extremely eccentric and absent-minded young man, but not without a certain spirit of pride," he said. "He was very popular with the ladies, in spite of his small size; but he had a most unusual face, and he could cast a spell on any woman with his eyes." Describing the existing portraits as "cosy and pretty", O'Brien explained the thinking behind his new painting. "I know of few musicians of real depth where you can't see some of that complexity in the face. So to find the Mozart who was obsessively driven, who pushed boundaries and who lived in a world where harsh poverty and crime were a very real facts, I looked at musicians from our own era to provide some inspiration. "Photos of Johnny Cash and Eric Clapton suggested both obsession and some kind of danger. Johnny Rotten provided a certain precocious brilliance, and I related to those for Mozart." O'Brien previously made headlines by creating a portrait of Beethoven for the cover of Gramophone magazine, which was inspired by U2 singer Bono. The portrait accompanies the Northern Sinfonia's new season, which includes a series of concerts called Reclaiming Mozart. They begin on Friday, 18 September with the first movement of Mozart's Symphony No. 25, and will also include his Clarinet Concerto and the rarely performed Symphony No. 33. Musical director Vogt will be the soloist in the Quintet for Piano and Wind, of which Mozart once wrote: "I myself consider it to be the best thing I have written in my life." The German concert pianist and conductor, who recently played the first night of the Proms, is an avowed Mozart fan - whose desert island disc would be a box set of the composer's works. In his first season as director of the Sinfonia, he plans to stage a number of "pop-up" concerts in venues that echo the "darker corners of Vienna" that Mozart would have frequented in the 18th Century.